There are so many incredible DIY craft tutorials out there to try – but how do we scratch that creative itch without compromising our earth-loving-ethics? That’s what the “Greening Martha” series is all about! I take some of the most lusted after Martha Stewart tutorials and give them an eco-friendly makeover, making you feel better about indulging your crafty cravings! With Thanksgiving just around the corner, I thought it was high-time to get some seasonal tutorials going. 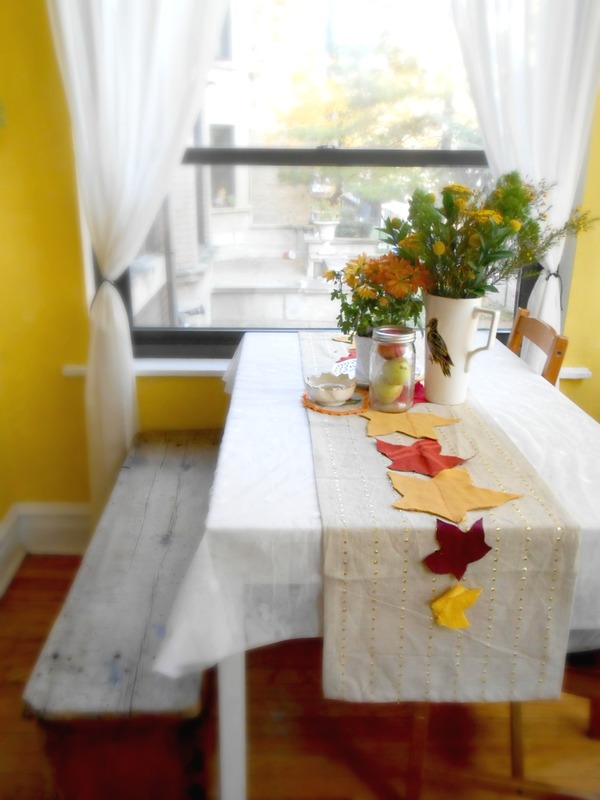 This month I’m bringing you a DIY twist for dressing up your holiday table: the Eco-Chic Autumn Table Runner. Designed after Martha’s “Festive Fall Felt Trivets“, my rendition of this uber cute seasonal decor utilizes leftover fabric scraps from sweatshirts and t-shirts instead of virgin materials. By using textiles that you already have lying about your home you can spice up your Thanksgiving spread without purchasing new fabric, which wastes valuable resources and pollutes the environment. For an in-depth account of the full effects of the textile industry, read this report from the Indian Textile Journal, which documents each step of the fabric creation process and its impact on the planet. So in the true spirit of the “Greening Martha” series, here’s a fun eco-friendly tutorial that will have you jumping for joy with your Thanksgiving table design, while feeling good about your conscious craft choices. Gather up your fabric, paying particular attention to the color scheme. Warm, earthy autumnal tones are best. Also try to find a variety of fabrics to create a more rustic look. Think cotton, knits, fleeces and other cozy textures. 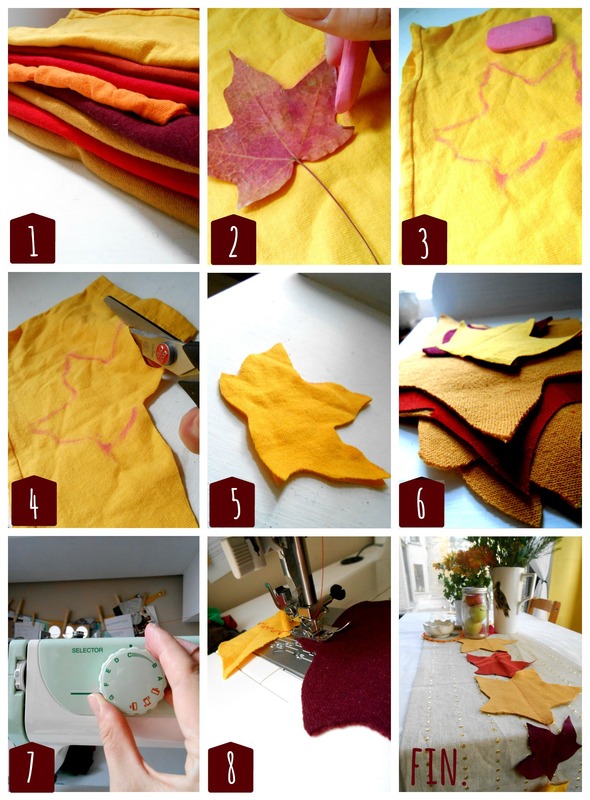 Grab your leaf and set it down on your first piece of fabric. Outline the leaf’s shape using fabric chalk, a marker, crayon, or anything else you may have lying around. Cutout your leaf outline – doubling the fabric if you want to be extra efficient. Trim up your leaf cutout to ensure it’s look even sharp. Repeat steps 2-5 with your other fabrics. Once all your leaf shaped are cut out, set your sewing machine to a zig zag stitch pattern. If you’re stitching by hand – skip this step. One leaf at a time, stitch across the surface of the shape, lining up your next leaf just after you hit the edge. Alternate the orientations of the leaves with each new shape addition to ensure a more natural pattern. And that’s it! 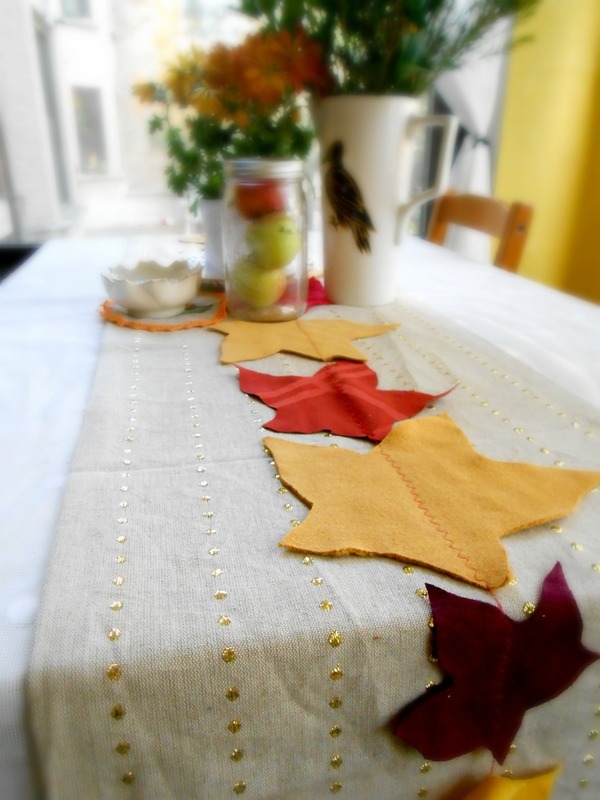 In fifteen minutes or less you can have an eco-savvy, super chic table runner with which to adorn your Thanksgiving spread. It’s an easy, affordable, and of course, earth-friendly way to liven up your space without compromising your ethics. Is there a sustainable how-to that’s caught your eyes for the holidays? If so – share the link in the comments below!